One of the most extraordinary and historically rich oriental products is suzane, that is, an embroidered decorative panel of white (less often colored) cotton fabric or silk, common among the peoples of Tajikistan and Uzbekistan as an element of interior decoration. From farsi “Suzan” is translated as “needle”, “needle”. The characteristic patterns of suzane are rosettes, flower motifs, images of birds, ancient magic symbols. These are real works of folk art accompany the life of a person from childhood to old age, form his taste, instill a sense of beauty in him. Large decorative suzane were created, as a rule, to the most solemn events in the family. Especially a lot of different embroideries were preparing for the wedding in the family of the bride, where they were an obligatory part of the dowry and represented the set necessary for the beginning of the life of the young family. Ornamental motifs served as a wish for happiness, well-being, a symbol of fertility. When it comes to the dimensions of embroidered suzane or other products embroidered in the style of suzane, here we can mention a recent event. In Uzbekistan, the world’s greatest suzane silk carpet was recently woven by hand. 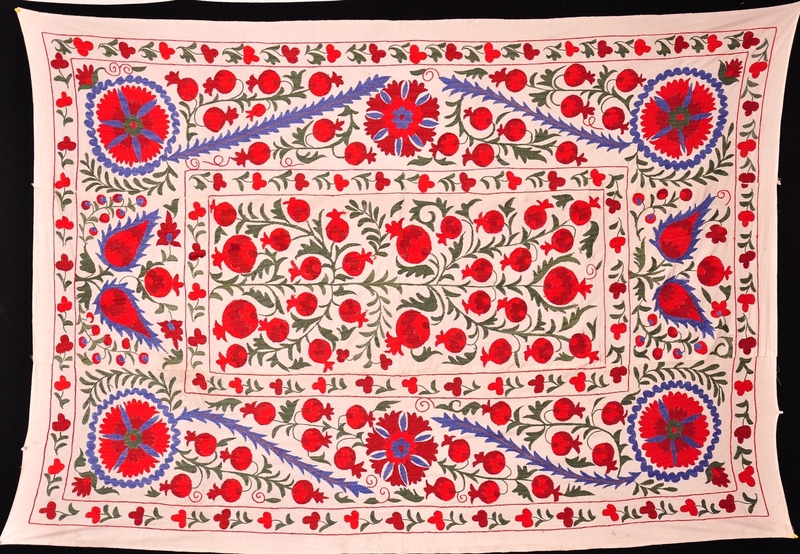 This technique means “embroidered with a needle.” A magnificent piece, comparable to luxurious works of art, was made for the Bakhshi International Festival of Art, as a talisman. The event will be held April 5-10 in the mountains of Uzbekistan. In the future, it is planned to hold a festival every 2 years. 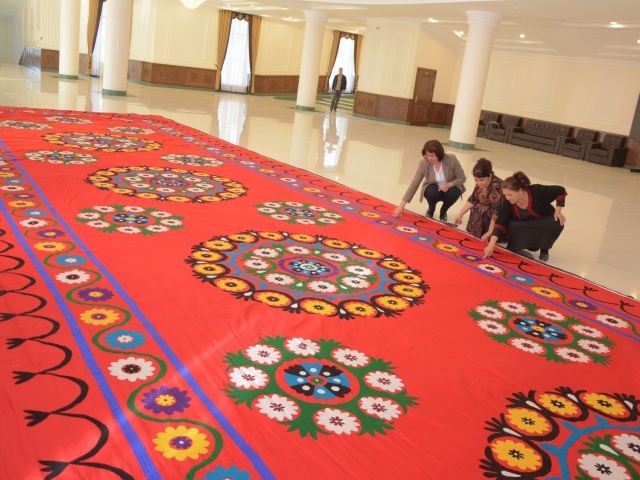 The length of the giant suzane carpet is 25 meters, the width is 6 meters, and the weight of the product is 60 kg. Over its creation over the course of many months worked the 20 best craftswomen. As you know, as soon as belief in the miraculous power of folk art dries up, it falls into decay. Why does a modern man have so much energy to spend on laborious manual work when you can buy ready-made beautiful things? Who seriously trust the primitive magic of embroidered patterns? But ancient suzani, preserved in museums, beckon with their amazing beauty, enticing with the bliss of “eternal gardens where rivers flow down below,” fascinate and awaken to creativity. These embroideries serve as models for today’s craftswomen in Uzbekistan and Tajikistan, Kazakhstan, Kyrgyzstan and Turkmenistan, who are trying to revive folk art, closer to its former perfection. The skill of talented artists and weavers will always admire millions of eyes around the world, and we hope such events will always be held and transfer the skill of the masters to the next generation. This entry was posted in Fashion, Home + Decor. Bookmark the permalink.